The two parts of this mount are magnetised (using x12 Rare Earth Magnets). One part screws into a standard 67mm threaded port, then a 67mm macro lens is screwed into the second part. 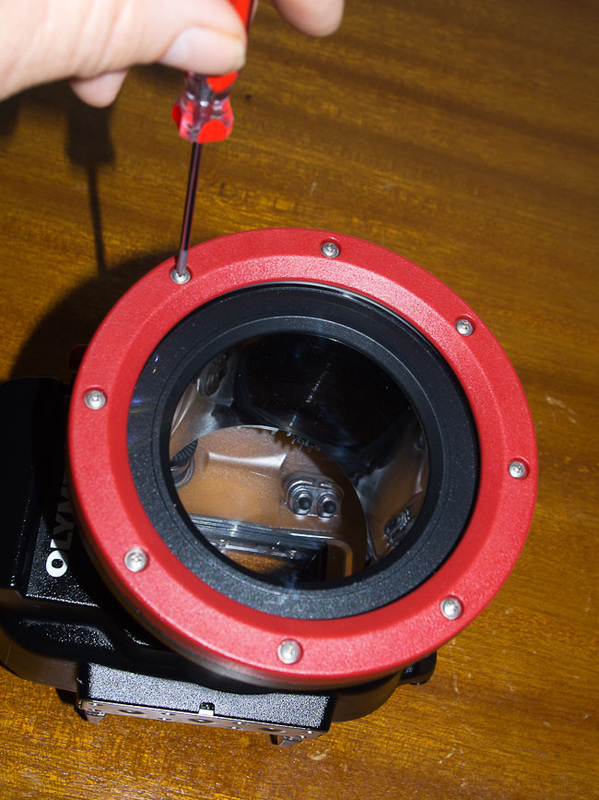 Then the wet macro lens is bought close to the port and the two parts are attracted and "stick" together. The shape of the mounts aligns them as they snap together. 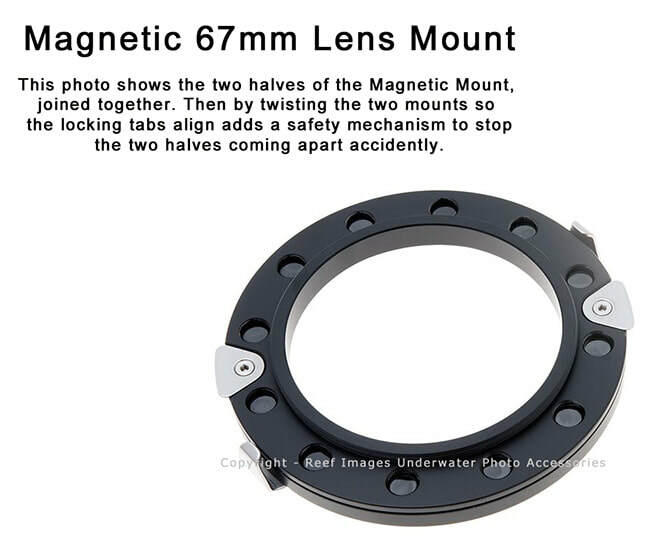 Magnets are strong enough to hold the lens onto the port, without falling off. But can removed by gripping the wet lens and twisting off. There is also a locking mechanism. 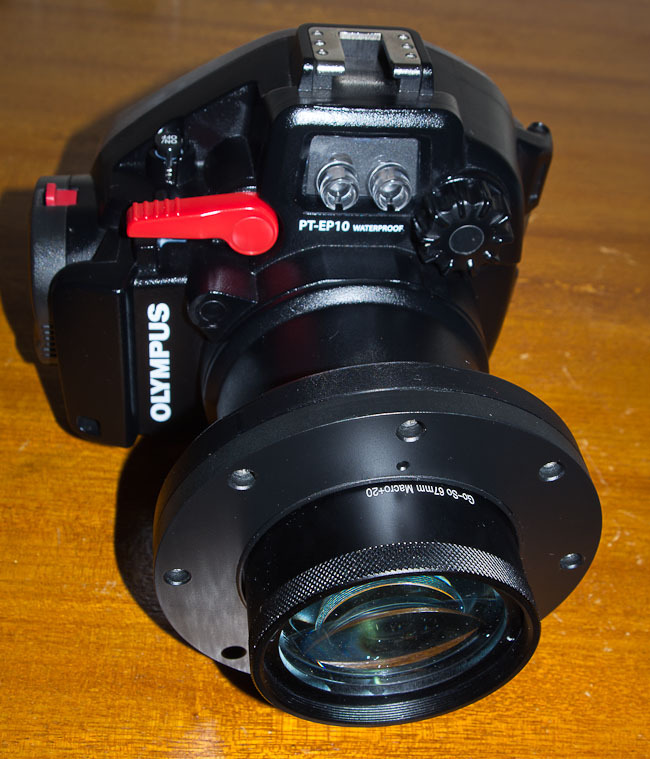 No more frustration screwing on/off lenses underwater! Olympus housing 67mm wet lens adaptor. Fits all of the original Olympus OMD Housings fitted with the PPO-EP01 Flat Port, (PT-EP08, PT-EP11, PT-Ep13 & Pt-EP14). also all Olympus PEN housings (PT-EP01, PT-EP03, PT-EP05, PT-EP06, PT-EP10 & PT-EP12. This adapter replaces the red ring fitted to the housing from the factory. This adaptor provides a 67mm threaded fitting for the fitment of 67mm threaded wet macro lenses directly to the front of the port. The wet lens will now sit much closer to the front port (no large gaps) than the Olympus add-on adapter giving best optical quality, and no bulky accessory adaptor to carry around underwater! Easily fitted by the end user with just a small phillips screwdriver (full instructions supplied). The adapter can be removed if you want to return the port back to original perhaps when you sell your housing or upgrade. There is no permanent modification. The Olympus 67mm Adapter Wet Lens Adapter allows the following Olympus M.Zuiko lenses to work with wet macro lenses without any restriction: 14-42mm, 60mm Macro, 12-50mm zoom. Replace the standard red coloured front ring and fit the threaded unit. Looking for Flip Mount or Swing Away Adapters ?